Schizophrenia - A2 Lesson and revision notes on the schizophrenia module in AQA A2 Psychology. It contains the topic of the diagnosis and classification of schizophrenia and its evaluations. It contains the biological explanations - including genetics, the dopamine hypothesis and neural correlates - as well as the treatments: typical and atypical antipsychotics. It also contains the psychological explanations of schizophrenia: family dysfunction and cognitive explanations - as well as the treatments of CBT, family therapy and token economies. To round it off, the interactionist approach is covered - as well as comprehensive AO3 evaluations for all topics. A* notes for Approaches Summarised notes for Approaches in Paper 2. Written for the NEW 2015 AQA Psychology spec. A2 RESEARCH METHODS - NOTES IN FULL DETAIL, A* QUALITY A" Research Methods notes for the the new AQA Psychology A-Level specification. These notes will guarantee you A* quality 16 and 12 markers. Being used by previous students for the 2017 exams, this has helped many to reach their goals and find this topic (which is quite tricky) easy. If you do want an A - A* this summer, download this. ISSUES & DEBATES - ALL NOTES IN FULL DETAIL A* QUALITY Issues and Debates for the the new AQA Psychology A-Level specification. These notes will guarantee you A* quality 16 markers. Being used by previous students for the 2017 exams, this has helped many to reach their goals and find this topic (which is quite tricky) easy. If you do want an A - A* this summer, download this. Issues and Debates complete revision notes - evaluations and examples included A condensed set of AO1s and AO3s for Issues and Debates from the NEW 2015 spec for AQA Psychology. Includes examples for each topic and detailed AO1s and AO3s to get you full marks in each essay. A* notes for Gender Summarised notes for the whole of Gender. Includes detailed AO1s and AO3s to get you full marks in each essay. Written for the NEW 2015 AQA Psychology spec. Forensic Psychology - A2 Lesson and revision notes on the forensic psychology module in AQA A2 Psychology. It contains the following topics: Defining and measuring crime; offender profiling - including the top-down approach and the bottom-up (and geographical profiling); explanations of offending - A historical approach to offending behaviour, Genetic and neural explanations, Eysenck’s theory of the criminal personality, Cognitive explanations, Differential association theory and Psychodynamic explanations; and dealing with offending behaviour - Custodial sentencing, Behaviour modification, Anger management and Restorative justice. A2 PSYCHOLOGY REVISION PACK Topics include the biopsychology, relationships, schizophrenia and forensic psychology. all pages have detailed information with excellent diagrams and evaluation points. these booklets are a lot cheaper than buying the several books used to create them and a valuable resource to have. AQA Biopsychology New Spec 2018 condensed 16 markers all you need to know AQA specification for BIOPSYCHOLOGY In line with the new specification Condensed, with good evaluative points. Just understand and remember all the information. You'll be on your way to getting that A*. 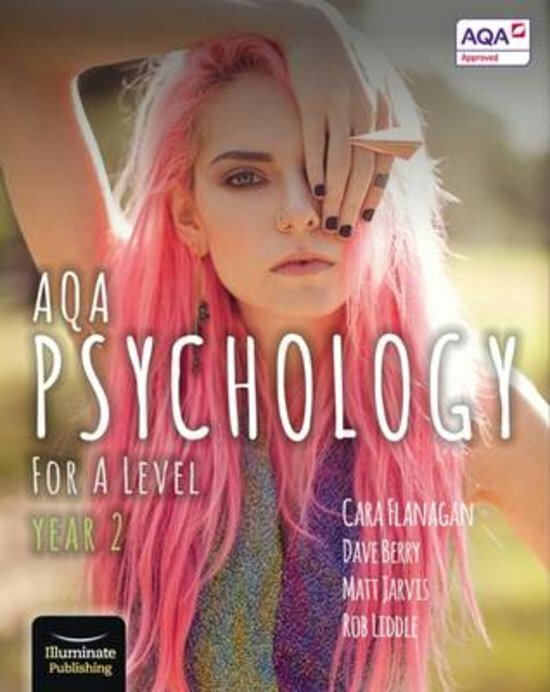 AQA PSYCHOLOGY 2019 The Approaches (Year 2)- Revision notes AQA A level Psychology notes - Year 2, the approaches. I am currently in my second year of the A-level course, with my exams in May. I have wrote/used these notes throughout the course and have consistently got A*s. I have used my teachers powerpoints (who has been an examiner for the course for 10 years ) which are based off the AQA Psychology for A level textbook written by Cara Flanagan and Dave Berry. All of the A01 is from this textbook, however for some of the A03 (Evaluation) my teacher uses a mix of predominantly this textbook but also some info from other textbooks too - but this is only when she finds evaluative points that are easier to understand/remember, so is not very often. I find her powerpoints a lot easier to understand as opposed to the textbook hence i decided to make my own revision notes using her power points instead of the textbook. Discuss gender bias in psychological research (16/16 mark essay) Written for IDA from the NEW 2015 AQA Psychology spec. It hasn't been officially published anywhere so you can submit it as your own. Discuss idiographic and nomothetic approaches in psychology (16/16 mark essay) Written for IDA from the NEW 2015 AQA Psychology spec. It hasn't been officially published anywhere so you can submit it as your own. Marked by examiner: Biopsychology 16 mark question (full marks) - plasticity and functional recovery after trauma This is an exemplar 16 mark question for the biopsychology topic. My psychology teacher, a current examiner, marked it and gave it full marks. Hemispheric lateralisation: 6 mark question (full marks awarded) Exemplar 6 mark question for biopsychology. Marked by my teacher who is a current examiner. Biological Psychology: How and Where Does It Fit In With The Rest? [A* Explanation] In depth contextual information about biological psychology in relation to the other topics; "how and where does it fit in with the rest?" Useful for reinforcing knowledge - essential reading for A* students. Restorative Justive Programmes (with evaluation and check it questions) This is a powerpoint presentation I wrote describing Restorative Justice programmes, good for those of you studying forensic psychology. It includes evaluation of the programmes and the answers I wrote to three check it questions. Hope this helps. Social Exchange Theory All of the A01 information on AQA psychology year 2 Relationships optional topic. All A01 is about social exchange theory. Duck\'s phase model A01 on Duck\'s phase model of relationships, taught in year 2 of the optional model of relationships. Biopsychology full (Year 1& Year 2) notes Comprehensive and detailed notes for the whole Biopsychology topic. This topic is much trickier than the rest so I hope that these will help. Created by a student in year 13, who was the recipient of the outstanding achievement in Psychology award in year 12. I also tutor in psychology, and have access to a range of different textbooks which I have used to make these notes. I rigidly adhere to the specification in the creation of these notes. Sur cette page, tu trouveras des résumés, des guides de révision et bien plus de livres de révision AQA Psychology for A Level Year 2 - Student Book, écrits par Cara Flanagan & Dave Berry. Les résumés sont écrits par les étudiants eux- mêmes, ce qui te donne les meilleurs renseignements sur ce qui est important de réviser dans ce livre. Les sujets tels que Psychology, AQA, a level, aqa, psychology, notes, cognitive & psychodynamic seront traités.